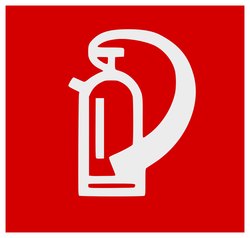 ﻿﻿DRY CHEMICAL﻿ -﻿ extinguishers are either stored-pressure models or cartridge-operated models. The stored-pressure models have a lever above the handle for operation. The cartridge-operated models require two steps: Depress the cartridge lever, and then squeeze the nozzle at the end of the hose. The dry chemicals leave a residue that must be cleaned up after use.